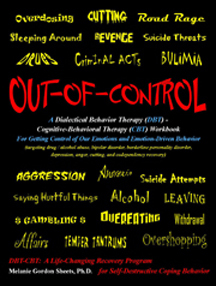 ← DBT – CBT Training Workshop – Midland, Texas – June 21, 2010 ~ ~ ~ River Crest Hospital presents “From Chaos and Conflict…to Peace and Stability” – a one-day workshop with Melanie Gordon Sheets, Ph.D. This entry was posted in About the Workbook and tagged DB-CBT Workbook. Bookmark the permalink.